This fall, Werner Herzog brings us two exciting new films: My Son, My Son, What Have You Done, about a guy inspired by Sophocles to kill his mom, and Bad Lieutenant: Port of Call New Orleans, about a crooked, drug-addicted cop (Nicolas Cage) losing his grip on reality. 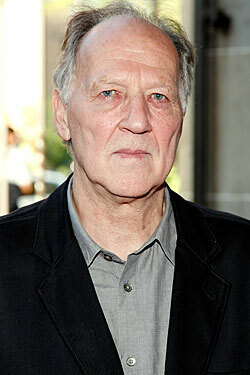 Herzog spoke with Vulture about working with Cage and why Bad Lieutenant is no remake. Craft. Maybe. But I refuse to call what I do art because it reeks of academia and I am a rogue. I believe in a totally guerrilla style of filmmaking. It’s about freedom. We spoke with Nicolas Cage yesterday, and he described the film as collaboration. There’s not one time we disagreed. We work in a similar way. The iguanas, for example, that was my idea. I thought drugs were destroying Terrence’s mind. So let’s have him see iguanas. Let’s have the iguana sing. Cage also told us he’s a fan of your most famous leading man, Klaus Kinski. I understand, because even though Kinski was a difficult person, he was also a great actor. I took Kinski to his limits and got the most remarkable work out of him. Kinski made 205 movies, but the only five people talk about are the ones he made with me. So Nic sees that, and he knows that I will bring out the best in him. Cage would drink during the shooting of Leaving Las Vegas to put himself in character. What about Bad Lieutenant? There’s a scene where Terence rips open a bag of coke and snorts it. Nic was so realistic I was frightened. I thought he was no longer snorting the prop cocaine, the saccharine. So I asked Nic, “What is it that you are snorting?” He just smiled and said, “The prop, of course.” But he was just so realistic. The movie is hilarious but also challenging. No, it’s just the opposite. I’ve never experienced such an intense reaction to one of my movies. The audience got all the dark humor and the subtle details. There was more laughter at my movie than at an Eddie Murphy comedy. The movie is not a comedy, but it has a lot of dark, black humor. Cage told us that he had some dramatic experiences in New Orleans. Nic did speak to me about being reborn in New Orleans, and I sensed that there was something significant for him about coming back to the city. I did not speak to him about these things. Our relationship was professional. Nic invited me to stay at his home in New Orleans, and I told him no. We would meet on the set, where a director and his actor are supposed to meet. We would not be two men meeting unshaven in the morning over coffee.